What can we learn from our experiences? Last week, I attended the Global Leadership Summit and was able to hear a variety of professional speakers give their thoughts on leadership. As someone who takes diligent notes, I wanted to share my takeaways from this event with you. Over the next two weeks in my #CJJblog I will be sharing some of what I learned at this event. Have you attended a memorable event recently? I would love to hear about it. Please also reach out to me via social media if you have any stories or experiences while attending a speaking event. I’m also open to suggestions for event I can attend as well! Enjoy. 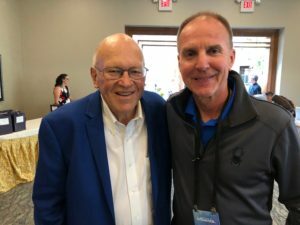 Ken Blanchard. Being a servant leader. Dr. Blanchard (pictured above) did a fantastic job teaching us about how to be servant leaders. Instead of having love of power, teach the power of love. Change the leadership pyramid. Instead of working for the leader, the leader should work for the people. How do you change things up? Craig Groeschel. Pastor of the Life Church. There are four keys that all efficient leaders have: heart, passion, humility, and resiliency. Angela Ahrendts. Senior VP of Apple. Three C’s of leadership: communication, celebration, and connection. Always remember that great leaders are great listeners. T.D. Jakes. Dream something so amazing, it scares you. Losing stimulates growth. What did you learn from your last failure? Believe in yourself so much, others laugh at you. Danny Meyer. Establishments that provide the best service last the longest. How do you provide the best service? Here are the five A’s of making mistakes: be aware, acknowledge failure, apologize, act to correct, and apply additional generosity. Did You Know? Coach Jim Johnson will be speaking on leadership at the Monroe County Sherriff’s department on August 22nd. « How are you handling the dog days of summer?